Launch photographer Ben Cooper captured this photo of the SpaceX Falcon 9 rocket making its maiden flight June 4, 2010 from Cape Canaveral, Fla.
A private rocket is set to launch toward the International Space Station next week, and viewers in Florida will have an awesome view. The unmanned SpaceX Dragon capsule is due to lift off on the company's Falcon 9 rocket from Cape Canaveral Air Force Station Sunday (Oct. 7) at 8:35 p.m. EDT (0035 GMT Monday). The commercially built spacecraft will deliver food and supplies to the crew of the International Space Station in the first of 12 cargo missions SpaceX is contracted for by NASA. The liftoff will be a night launch, one of the most impressive kinds of rocket launches to view, and should be visible across Florida's Space Coast and beyond. The best viewing spot requires a ticket through NASA's Kennedy Space Center Visitor Complex, but offers an incredible view at only 4 miles from the Falcon's launch pad. Transportation to this spot, called the NASA Causeway, is selling for $20 plus admission to the Visitor Complex ($50 + tax for adults and $40 + tax for children ages 3-11). 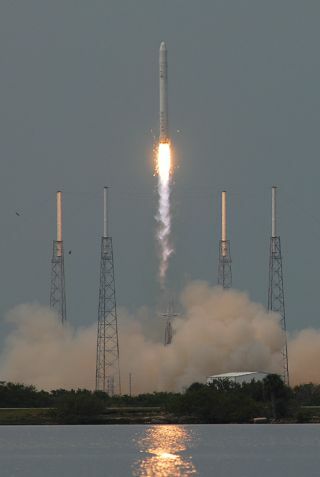 "Because SpaceX launches from a different launch pad than the shuttle, it's a lot closer to the Causeway," Cooper said. "I believe it's the closest viewing site they've ever sold tickets for." If the launch is delayed, Visitor Complex admission will be honored the following day for a second launch attempt, although guests may have to purchase Causeway tickets again. "We've seen a great response, but we still have some tickets available, if folks are still interested," Visitor Complex spokeswoman Andrea Farmer told SPACE.com. "It's going to be a spectacular launch," she added. "There's nothing like a night launch on the Florida Space Coast." For would-be observers unwilling or unable to buy tickets through Kennedy Space Center, there are plenty of great places to watch that don't require a fee. Cooper advises people to view from Port Canaveral, a popular cruise ship port near the space center that's only 8 miles from the SpaceX launch pad. He recommended watching from the side of the road on Route 401, the street behind the cruise terminals, or on Route 528 (the latter has more room for parking, he said). The most popular viewing spots for space shuttle launches, such as Titusville's Space View Park, are not necessarily good spots for watching the Falcon blast off, because of the difference in location between their launch pads. Cooper's website showcases sample launch photos taken at the various viewing sites open to the public. He recommends photographing night launches with professional cameras only — point-and-shoots usually produce blurry blobs of light. "If you have a professional camera and it's a night launch, my recommendation is to set your shot up and let the camera do the work while you watch it, especially if it's your first launch," he said. If SpaceX delays the launch, T-zero time is set to move up by 24 minutes each day. So if the launch is pushed to Monday (Oct. 8), for example, the Falcon 9 will lift off at 8:11 p.m. EDT (0011 GMT Tuesday). As the launch time moves earlier, it heads from night launch territory into twilight. If the flight is pushed as far as Oct. 11, it will be lifting off just at sunset, and any later will mean a daytime launch. "In my opinion, sunrise and sunset are the best launches," Cooper said. "As it gets more into the daytime it'll become a little less spectacular." And if you can't make it to Florida to watch the launch, you can always check out NASA's live broadcast on NASA TV.